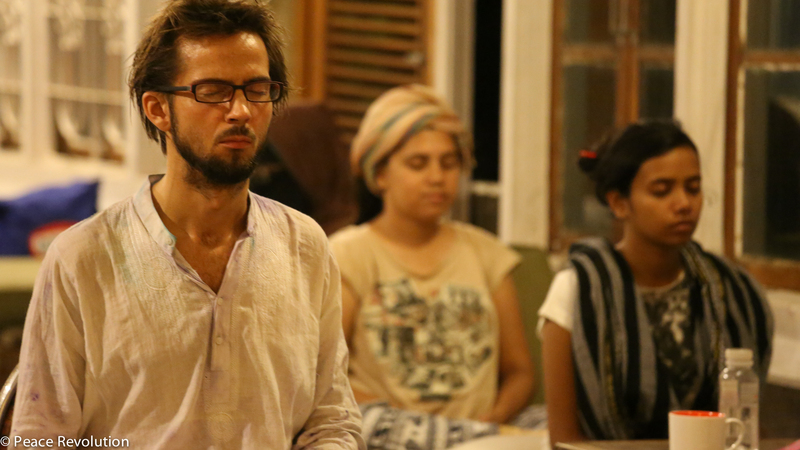 Many of the Peace Revolution guided sessions finish with a loving-kindness meditation. I feel happy and silently excited during this moment. The idea is to garner enough peace energy to share the love, joy, kindness with communities and the greater world. Practicing loving-kindness makes a person open to use it on a daily basis in real life, be kinder, more mindful, in the everyday human interactions. Here is the chance to show unfiltered, unconditional love to people closest to us and those we respect. Not only that, it can also work as an exercise to share kindness with people we have a difficult relationship with. This perhaps makes it easier to deal with them in a neutral manner in the real world, so some worries are taken care of. And of course, this is a wonderful, spiritual chance to share love to the greater world, beyond our horizons, to every living being, however small… to give equal respect and appreciation. I thus wonder what effect this practice will have on generally bitter and negative people. There should be some experiments… but then, such people themselves must come into terms with the bitterness they share, otherwise there will not have the openness to try loving-kindness meditation. The first person who benefits from this outreach of love is the person themselves. Negative people can thus learn to be less tough on themselves and inculcate a sense of joy, love and kindness for their own soul. I so love the monk’s voice when he tells us to share loving-kindness to the greater universe. I really identify with these words and imagined the peace energy inside being spread beyond my being….to reach those in happiness and also those who are in suffering. And it is sad how the second group of people exists in many corners of the world – refugees, victims of poverty or illness, vulnerable to disasters, or having no hope for a tomorrow. I am made aware of the natural living world around us. The life running inside every leaf and insect and the infinite wisdom they carry somehow. Visualization was important to my meditation. I would see a blue peace energy being created in me, which then spread into the world from my head. In the process, I am filled with a sense of responsibility for the natural world, and the world of people – all of God’s creations. For those moments till the end of my session, I feel great joy, and it is something to look forward to!